Quesdaillas rank at the top of the list when it comes to quick and easy dinners and it does not get any better than these healthy chicken and broccoli quesadillas. The good and the bad news as it relates to quesdaillas is that they can be really heavy or really like depending on how you make them. If you use a whole wheat tortilla, reduced fat cheese and stuff them with an assortment of vegetables and protein, they can be a fulfilling and low calorie meal. 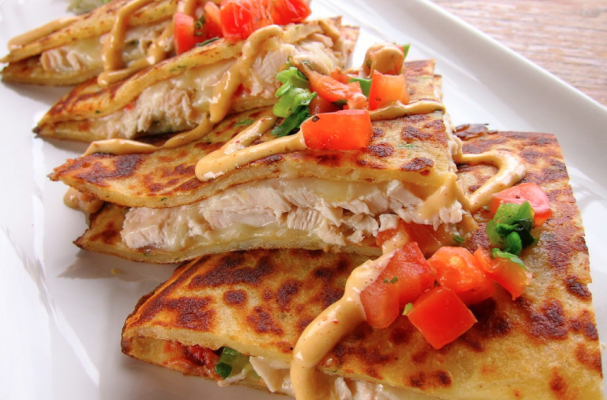 These broccoli and chicken quesadillas do just that. Weighing in at only 390 calories, you can afford to serve some reduced fat sour cream or guacamole on the side. For full recipe instructions, click here or watch the video below.